These good Fourth of July movies are ideally suited for the upcoming holiday weekend. Between trips to the lake and blowing your fingers off with fireworks, you owe it to yourself to relax on the couch with one or more quality films featuring Americans at their finest. In case you’re not from the U.S. or just really bad at American history, let’s take a quick look at the meaning of the Fourth of July aka Independence Day. 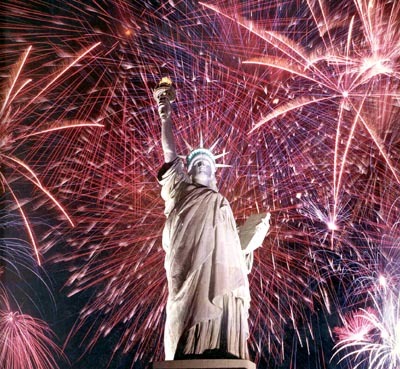 It’s meant to celebrate the adoption of the Declaration of Independence on July 4th, 1776, an event which soon led to the American Revolutionary War against the British. The document, however, was not signed on this date. Most signees put pen to parchment on August 2nd of the same year, but the legend surrounding the date became so strong that even participants such as John Adams and Thomas Jefferson came to believe it in their later years. Yankee Doodle Dandy (1942) – James Cagney won a Best Actor Oscar for his portrayal of George M. Cohan, the Broadway legend responsible for such patriotic songs as “Yankee Doodle Dandy,” “Over There,” and “You’re a Grand Old Flag.” Best known for his roles as a tough guy, Cagney proves equally adept at singing and dancing, perfectly mimicking Cohan’s unique performance style. A virtual explosion of American patriotism, the film would garner eight Oscar nomination and three wins. It also holds the distinction of being the first film colorized by Ted Turner back in the ‘80s. 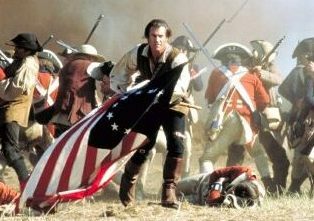 The Patriot (2000) – As his fellow colonists complain about the British and prepare to launch the American Revolution, widower Benjamin Martin (Mel Gibson), a veteran of the French and Indian Wars, simply wants to live in peace and raise his seven children. But the war soon comes knocking on his door, and the British make the mistake of killing one of his brood. That’s when Martin goes on the warpath, using his experience to give those dirty Brits all kinds of hell. The battle scenes are plentiful and grueling, featuring our hero pulling off moves that no mortal man could accomplish. Heath Ledger plays his oldest son, and the rest of the cast includes standouts like Jason Isaacs, Chris Cooper, Joely Richardson, and Tcheky Karyo. Rent hundreds of thousands of movies from Netflix for as little as $7.99 per month. They even offer a free trial membership. Mr. Smith Goes to Washington (1939) – Frank Capra and Jimmy Stewart team up for this look at an idealistic politician and his struggles against the corrupt political machinery in Washington. Nominated for 11 Academy Awards, it transformed Stewart into a major star and generated more than a little controversy for its time. Claude Rains is outstanding as a charismatic-yet-corrupt politician whose conscience begins to get the better of him. Independence Day (1996) – The human race teeters on the verge of extinction after a race of malevolent aliens show up and start wiping out cities with their advanced weaponry. Luckily for the planet, America isn’t completely destroyed, allowing men like fighter pilot Steven Hiller (Will Smith) and MIT geek David Levinson (Jeff Goldblum) to concoct a plan for a comeback. Directed by Roland Emmerich, a guy who’s endangered the Earth in multiple films, Independence Day boasts big summer special effects, a cast with plenty of recognizable faces, and a major comeback that takes place on the Fourth of July. Johnny Tremain (1957) – Based on a children’s novel, this production was originally made for television but later given a theatrical release by Walt Disney. When Boston silversmith Johnny Tremain (Hal Stalmaster) suffers a career-ending injury, he ends up joining the Sons of Liberty, a group of patriots dissatisfied with the British treatment of the colonists. Along the way, he rubs elbows with Joseph Warren, Paul Revere, and Samuel Adams (who hopefully shared his recipe for beer). Concluding with the beginning of the American Revolutionary War, the film provides a broad overview of life in colonial times. The Crossing (2000) – While this film was produced for cable television, it still earns a spot on my list of good 4th of July movies. Why? 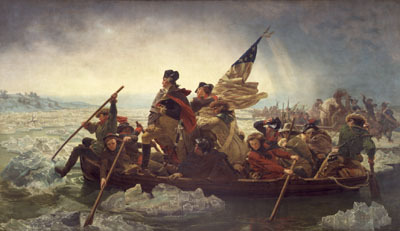 First of all, it’s set during the American Revolutionary War and tells the story of George Washington’s famous crossing of the Delaware River and the subsequent Battle of Trenton. Secondly, Jeff Daniels stars as George Washington. That’s right, Harry from Dumb and Dumber as the “Father of Our Country.” Oh, and the production also won a Peabody Award for excellence in broadcasting. If you watch it, just be sure to do some follow-up reading, as not every event presented in The Crossing is factually accurate. John Paul Jones (1959) – An epic biography about John Paul Jones, the heroic naval commander during the American Revolution who uttered the immortal words “I have not yet begun to fight!” Robert Stack plays Jones, Mia Farrow makes her screen debut, and Bette Davis has a small part as Empress Catherine the Great. Die Hard (1988) – In many ways, NYPD officer John McClane (Bruce Willis) embodies the modern-day American spirit. With a smart mouth and a mean right cross, he’s the plucky underdog who always manages to come out on top. In the first installment of the long-running franchise, he finds himself trapped in a Los Angeles skyscraper with a whole host of machine-gun-wielding Eurotrash. Guess who wins? Alan Rickman makes one of the greatest big-screen debuts ever as the villainous Hans Gruber, and there’s enough gunplay to make a member of the NRA blush. Quite simply the finest action film ever made. Field of Dreams (1989) – There’s nothing more American than baseball and apple pie, and this emotional Kevin Costner sports classic has plenty of the former. 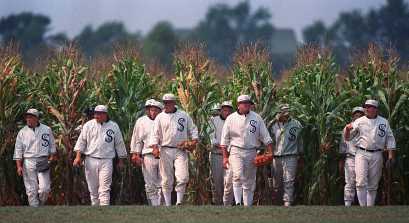 Costner plays Ray Kinsella, a simple farmer who hears a voice in his cornfield, prompting him to plow under part of his crop and build a baseball field. Before you can say “spiritually uplifting,” players from the past start emerging to engage in the national pastime. A sentimental journey featuring Costner at his all-American best, with James Earl Jones, Amy Madigan, and Ray Liotta in supporting roles. The Time of Their Lives (1946) – Jumping from 1780 to 1946, this Bud Abbott and Lou Costello comedy romp revolves around a pair of patriots (Abbott and Marjorie Reynolds) who are accidentally killed while trying to expose Benedict Arnold’s infamous plot. 166 years later, their ghosts still haunt the estate where they died, but a gathering of friends and a séance may hold the key to their release. Bud and Lou were in the middle of a rocky patch in their relationship, so don’t expect them to share much screen time together. Still, The Time of Their Lives remains a breezy comedy classic with firm ties to the American Revolution. I hope you’ve enjoyed this list of good Fourth of July movies. If so, be sure to check out the other OGM links included below. And don’t forget that all the films listed above can be rented through Netflix. We do receive a commission if you become a member, but all proceeds go right back into our site. This entry was posted on Friday, July 2nd, 2010 at 9:56 am and is filed under Good Movies. You can follow any responses to this entry through the RSS 2.0 feed. You can leave a response, or trackback from your own site. Ummm Die Hard? Am I the only one that realizes it’s a specifically Christmas movie? Maybe Live Free or Die Hard, but not the original. This list is stupid. Field of Dreams? Johnny Tremain? Only if you want to be watching movies alone on the fourth. Die Hard takes place during Christmas? I never knew that until now. Thanks for the tip, Brian.